Have you ever heard someone compare Internet overuse to drug addiction? Whether it be from someone you know or from a scholarly article you read, more parents and teachers believe the same effects of smartphones, tablets, and gaming consoles like PS4 and Xbox have the same effects as drugs. In fact, psychotherapist Nicholas Kardaras coined the term ‘digital heroin’ to express this very concept. That said, how accurate are these claims? Are these claims true, or should we fear that the upcoming generations are going to eventually overdose on this so-called digital heroin? The red areas represent spotty white matter in the brain, which makes it more difficult for the brain to process and communicate information. Let’s take two examples: a social media ‘like’ and a text message. When you receive a like on a social media post or a message on WhatsApp, neurotransmitters called dopamine get sent to the ‘reward center’ of your brain called the ventral striatum. Specifically dopamine affects the regions of the brain that control emotional processing, attention spans, and decision making; these regions also get affected when you take drugs. As this happens over time, and because there is very little effort required in receiving a text, your brain begins to rewire itself. In other words, your brain affects your body as it craves more of the same type of excitement after each interaction you have. This is why we hear a lot of stories about kids who text and drive at the same time, or why they play online games for hours at a time. It’s why Dr. Peter Whybrow (Director of Neuroscience at UCLA), researchers in China, and Dr. Andrew Doan (the head of addiction research for the U.S. Navy and the Pentagon) all refer to screen technologies as a form of a digital drug. It is why parents should do everything they can to prevent their kids from getting hooked on screens both at home and at school. Okay, are you done striking fear on us about the overuse of technology? Of course there are concerns about Internet overuse, just like there is about anything else. However, to say that the use of the Internet can be compared to drug use is mind-boggling! First of all, before jumping to conclusions, we need to ask the question of whether technology is in fact a substance use disorder. So far, the authors of the Diagnostic and Statistical Manual of Mental Disorders (the world-renowned reference book for psychologists) relegate disorders related to the Internet because they do not have sufficient evidence for it. This is despite the fact that there are hundreds of studies about how using the Internet too much negatively impacts the brain; over 250 publications exist on Internet gaming disorder alone! The reason why there hasn’t been an Internet gaming disorder, or any Internet addiction disorder for that matter, is because there wasn’t much standardization on these studies. In addition, the qualifications for problematic behavior vary within these studies. This is not to say that Internet addictions do not exist and that there aren’t any psychological effects of using the Internet too much; there is plenty of anecdotal evidence to make this case. However, because we do not have a good handle on what qualifies as an internet addiction, we don’t know how prevalent it is or what kinds of environmental and physiological conditions people have to diagnose someone with it. To add more to this point, people can easily point to studies that reaffirm their claims that technology negatively impacts the brain. You can easily cherry-pick results that highlight all the positive aspects of technology on kids’ brains. • Research presented at an international anesthesiology conference in 2016 suggests that iPads are just as effective as conventional sedatives at keeping kids calm right before surgery. • An international study published in March 2016 found that gamers between the ages of 6 and 11 had a higher chance of performing better in school and experiencing less problems with their peers. • A 2012 study suggests that virtual reality training – with a digital device – helped boost social skills and cognition in young adults with autism. It is important to note that parents and teachers should both be aware of how online games, smartphone, and the Internet in general could be detrimental to a child’s development. However, people said the same thing about watching TV… and pretty much everyone has one in their home. It’s premature to call Internet overuse ‘digital heroin,’ specifically because we don’t know what the motive is for most people who do show psychological effects of Internet overuse. Both arguments present some valuable take-home points to discuss with your child, your spouse, or maybe even a friend with whom you’ve discussed this topic. 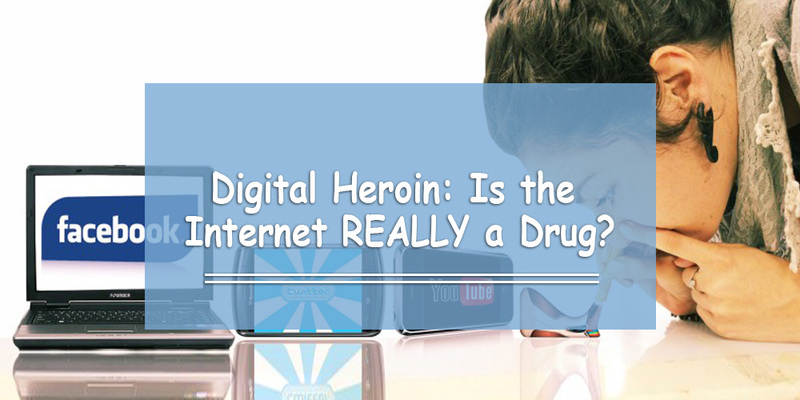 Which argument about the use of the term ‘digital heroin’ do you agree with? Watch this video to get a better picture of what the arguments present (with Dr. Nicholas Kardaras). Regardless of which side you relate to more, make sure you spread the word about educating the upcoming generation about the safe use of technology. It is essential that they stay conscious about the evolution of the Internet, the idea that they could be spending more time on it, and that they could potentially be hooked on it. Read more about online addiction right here on Online Sense!